Rep. Mike Pence will not run for Senate in Indiana. Washington (CNN) – Though it would have been next to impossible for him to garner the signatures necessary to get on the Republican primary ballot by Tuesday afternoon, Indiana Rep. Mike Pence re-iterated Monday that he has no interest in running for the Senate this year. National Republicans courted Pence to challenge Sen. Evan Bayh last month, before it was known that the Indiana Democrat was going to retire. Former Sen. Dan Coats entered the race earlier this month, but Pence's name was mentioned again after it was learned that Bayh would not seek a third term. "After receiving considerable encouragement to run for the United States Senate last month, Mr. Pence made a decision to seek re-election to the House of Representatives and help lead a conservative comeback in 2010 and that decision stands," Pence spokesman Matt Lloyd said. "Mr. Pence's decision was made irrespective of polls or Senator Bayh's intention to seek re-election." "Mr. Pence believes that Republicans will retake the House in 2010 and he counts it a privilege to be a part of the House Republican leadership during this historic election," he continued. "Mr. Pence has filed for re-election to the 6th Congressional District of Indiana and will continue serve his constituents and help lead the effort to retake the House of Representatives." 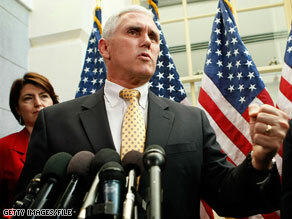 Pence is believed to be mulling a possible White House run in 2012. Some rotten candidate will come forward for the Republicans to Advance! I agree...the GOP will take back the majority in this year. Ha Ha Ha!!! Now this moron is a real piece of work. Indiana I feel sorry for you, with pence at the helm for you, you can rest assure your state will lose out. pence is a evil man, it's written all over his lying face. This man and bohener have so much hate for President Obama all you have to do is look at them when the President is around them, such haters they can't stand the fact that Barack Obama is THE president, Ha Ha get over it losers. Democrats and republicans you are tired old outdated parties that does not care about nothing but yourselves The senate is dead and the American people are tired of your bull. Pence is a little to the left of birthers, so he is too liberal to be elected to the senate. Thank you Mr. Pence-–you have a great strategy/plan in mind. The Republican Dan Coats just recently jumped into the race. Previously, he was VERY popular in Indiana--so he now has a VERY good chance of winning the Senate seat of Bayh. Coats had a very good chance of winning the seat, even before Evan Bayh announced his retirement. By you not running for the Senate-–you are guaranteeing wins for the Republicans in both the House and the Senate. I can't wait for the 2010 elections to get here-–as the power/control is going to be taken away from Obama, Pelosi and Reid. Pence is just another Republican wannabe. He wants to be something but he cannot figure out what. Wouldn't it be nice to get a real democrat, not just one of these libertards that calls him/herself a democrat to run again. It would make me actually vote for a democrat again. These people that call themselves democrats, including the great liar in chief himself are not democrats. They are elitists, gangstas, corrupt liars. What? Your point is ...? There are many people that do not like our current president. Anybody that says;" This is the greatest country on earth and who's gonna help me change it?!" The empty suit that is obama, is trying to ruin this country. He's so full of himself that he thinks the failure of his bogus policies is, not that people know what he wants and don't like it, but he didn't do a good job explaining it! Jane/Seattle – "Some rotten candidate will come forward for the Republicans to Advance!" Anything's better than another rotten Democrat. Mr. Pence has been Palinized. He's now one of the pure ones. All for the wealthy. He'd better live in a wealthy district. If vote this guy Pence, you get Rush Limbaugh and that's a straight ticket to hell and back. Good, cause he would lose! Pence is no EVAN BAYH No comparison! Believe me, the Republicans will come up with a lying alternate!!!! No wonder Bayh do want to run. The Republicans are "sickening"
the Senate!!!! Makes ME sick to see what is happening to our nation! WATCH OUT! for Independents who run that are REALLY Republicans! but he is all for LESS Government and ending IMPORTANT GOVERNMENT PROGRAMS that hurt the Middle Class. Interesting choice. I don't live in Indiana, but it seems like Pence is the most high-profile Republican in the state. The Democrats will still have a hard time defending Bayh's seat, but I'm sure they are breathing a sigh of relief that Pence isn't running. Look at the fist. Body language from Pence tells me he's a real jerk.